Just southeast of Seattle’s infamous Fremont Troll, the bittersweet skunk of fermenting hops wafts from a bright blue warehouse. Behind the blue walls, you will find Fremont Brewing Company, just barely a year old but quickly making its way to taps across the region. ded by long-time environmental advocates, Sara Nelson and Matt Lincecum, the emerging brewery focuses on locally sourced and organically grown ingredients. But Fremont Brewing’s commitment to sustainability doesn’t stop with the contents of their kegs. Having refurbished their home with RE Store treasures, Sara and Matt looked to the Seattle store for key elements of the brewery’s décor. “It’s better to reuse than to buy new, plus the materials bring a lot of history”, Sara explained. 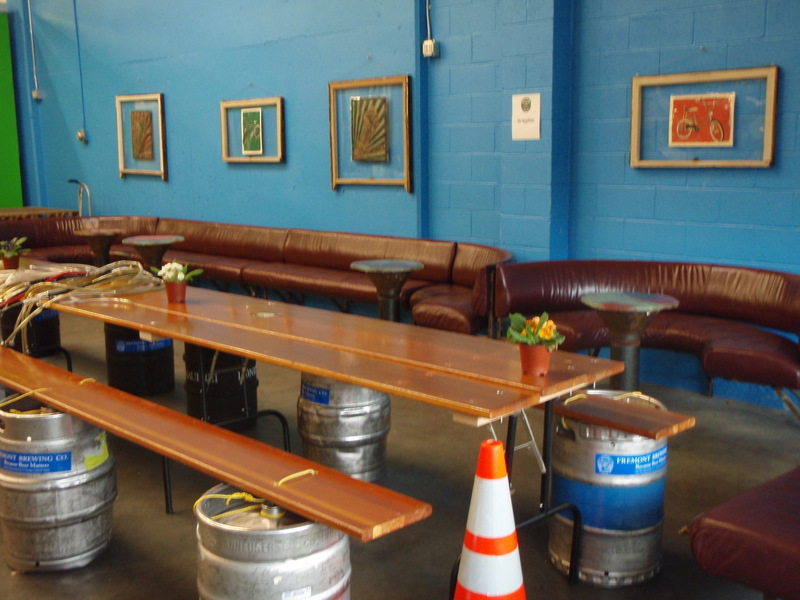 RE Store finds accentuate the brewery’s Urban Beer Garden. Patrons gather at a long banquet table and benches built from bleacher boards salvaged from Ballard High School. “There is still gum on the bottom,” Sara commented. Silkscreened t-shirts are stacked in a display reportedly salvaged from a Macy’s. “It was the color of calamine lotion,” Sara says, “we had to paint it.” On the walls, artwork by local painter Dan Stuckey hangs in wood framed windows found at the RE Store. A salvaged playground toy keeps the kids entertained. Nearby, a commissioned painting of the brewery, painted by Stuckey, includes the unique play toy reflected in the chrome of the brewing equipment. Sara explains, “We wanted to include the toy because now it’s a special part of our beer garden”. 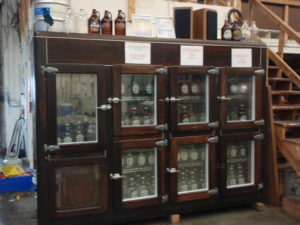 Each salvaged piece has a story, but none compare to the antique wooden cooler stocked full of growlers. As soon as Matt found the 1936 cooler, he knew it belonged in their brewery. But it wasn’t until they talked with RE Store staff about the origin of the piece, that they realized the cooler was more than an attractive centerpiece. 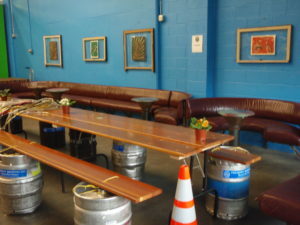 The cooler was salvaged from Pies & Pints, a North Seattle pub and eatery co-founded by Vince Gallapega. Vince gave Sara her first kiss, circa 1978, in Sacramento, California. The two crossed paths nearly twenty years later in Seattle and became good friends, sharing a love of good food, good beer, and community. Sadly, Vince passed away suddenly in 2007. The antique cooler, now proudly housing handcrafted beers, serves as a relic and an honor to an old friend. Raise a glass to history at the Fremont Brewing Urban Beer Garden or get a taste of their brew at the RE Store’s Trash Fashion Show on April 17. Cheers to salvage and re-use!